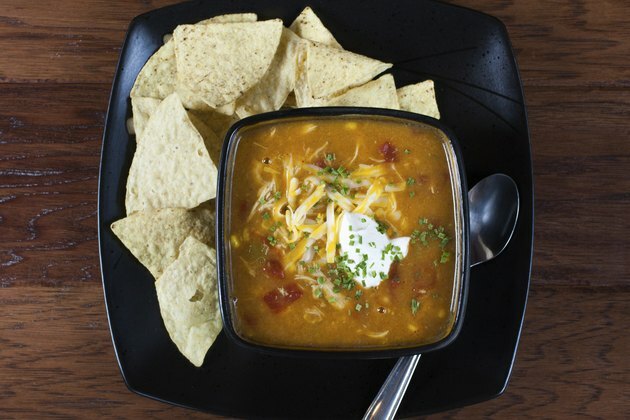 Green chili stew is a thick and filling Mexican dish that is often served for lunch or dinner. The ingredients for green chili stew typically include simply onions, tomatoes, potatoes, stew meat and chilies. If the result is too thin, it will resemble a spicy soup rather than thick, green chili stew. Rather than starting over or serving the dish too thin, you can thicken it with a few quick tricks. It takes at least 15 minutes to thicken green chili stew. Place two green chilies in a food processor and pulse until they form a smooth paste. Stir this green chili paste into the stew. If the stew is still too thin, add up to four more pureed green chilies. Combine the melted butter and flour in a small bowl. Whisk the mixture until it is smooth and add it to the stew. Stir the mixture into the stew and allow it to simmer for five minutes. Repeat the process once more is the stew is still too thin. Uncover the stew's pot and bring it to a simmer if neither the chili puree nor flour paste thickened it sufficiently. Allow the stew to simmer for up to three hours, stirring it every 15 minutes. Remove the pot from the heat as soon as it reaches your desired thickness. If the stew only needs a small amount of thickening, use just one of these methods.